How to set auto top-up of talk-time balance? You can set talk-time balance on your VOIP Line to “Auto Top-up” so that you don’t need to keep a watch on your talk-time balance amount and help yourself in saving your time and effort while avoiding the risk of running out of balance. Auto top-up of your VOIP Line is done using the money available in your DoorVaani “Account Credit”. You can set both the balance threshold level at which you want the auto top-up to happen and also the amount of money your VOIP Line is to be topped-up with. If you have multiple VOIP Lines in your account, you can set auto top-up on all or some of your VOIP Lines based on your needs. Please log in into your DoorVaani account. 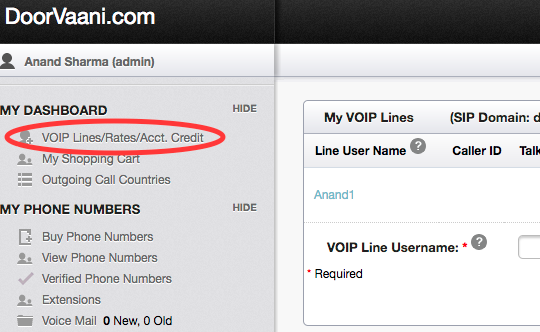 If you are already logged in, please click on “VOIP Lines / Rates / Acct. Credit” menu under MY DASHBOARD from the left hand side to see “My VOIP Lines” page. Once you are on the “My VOIP Lines” page, please click on your “VOIP Line User Name” to go to the “VOIP Line Details” page. Locate the auto top-up setup options on the VOIP Line details page. Check the auto top-up check box to “on” and also enter the balance level at which the top-up happens and enter the amount of money your VOIP line is to be topped-up with. Click “submit” button at the bottom of the page to save your auto top-up set up options.